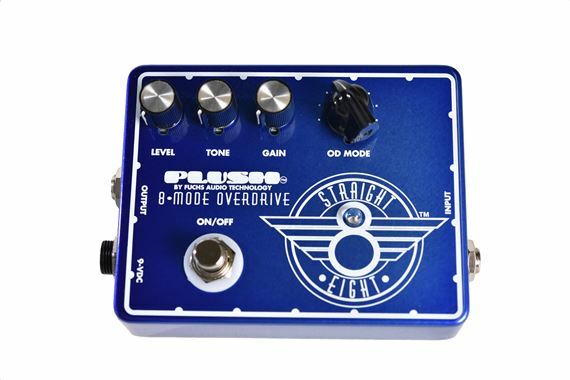 Order your Fuchs Plush Straight 8 Eight Voice Overdrive Pedal from AMS and enjoy 0% Interest Payment Plans, Free Shipping, Free Extended Warranty & 45 Day Money Back Guarantee. Years of testing on Andy’s pedalboard as well as feedback from various artists have led to the incredible Fuchs Plush Straight Eight pedal! The Straight-8 overdrive provides huge tonal possibilities while remaining very user-friend and, of course, with top-shelf components to ensure high-end tone. The 8-position mode switch alters the overall gain and compression, while tailoring the overall voice of the overdrive from bright and crunchy Tube Screamer1 style tones, to darker and more compressed overdriven ODS style tones. Precision OP low noise amp, 9 or 18 volt operation, battery or external power, 5-year warranty, cast aluminum enclosure, made in USA by Plush FX, a Division of Fuchs Audio technology! 8-way tone switch, plus level, gain and tone control.